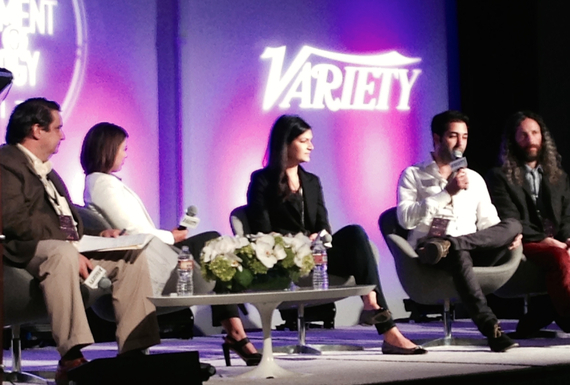 Digital Hollywood is in full swing at the Ritz Carlton in Marina del Rey, CA, kicking off the week with the Variety Entertainment & Technology Summit. In an afternoon session, "The Coveted Captive audience - Engaging And Monetizing Through Mobile," the esteemed panelists included executives from at Taco Bell, Tumblr, Tinder, Generator, and Pandora who shared their statistics and insights to their mobile strategies. Let's take a look at the strategies of each of these companies. Tinder, as we know, has become the hottest mobile dating app, now experiencing over ten million matches a day and 800 swipes per day. "I think the misconception is that Tinder is a dating app," said Justin Mateen - Tinder's Co-Founder and Chief Marketing Officer. "We consider ourselves a social discovery app, more of a competitor to social platforms," Mateen added. Tinder is now optimizing to connect new people. Mateen feels the value proposition is tremendous, which is why they've been able to grow so quickly. People are using Tinder for dating for the most part, but as time goes on, Tinder won't be optimized only for dating. "We are our own social platform and leverage other social platforms to the sense that it makes sense," said Mateen. He boasted about Tinder's 2000% growth last year. The average Tinder user spends ½ hour on the mobile app and they are growing by 10 times every day. As of now, Tinder is not charging for their app or providing advertising. Their monetization strategy includes focusing on the user experience and growing the user base both domestically and Internationally. Their future plan will include in app purchases to enhance the user experience when it comes time to monetize. Mateen explained that their plans are to begin to test different forms or advertising on Tinder. "We want to make sure that it's an organic ad and that our users can benefit from it." "People go to Tumblr to connect with content and follow the content that they love," said Sima Sistani, Tumblr's Director of Media. Where Facebook is about connections, Twitter is about communication, and Tumblr is about expression, explained Sistanti. Tumblr has seen 124% year-over-year growth. Sistanti believes that people aren't only moving to mobile, but they are finding more time in the day to access and share content on their mobile phones. Sistanti told the Variety attendees that after watching 43 minutes of TV, Tumblr is the second most engaged platform with 18 minutes of time spent consuming content in the Tumblr dashboard. When asked about follower count and trending, Sistani made sure to mention that with Tumblr, they're really interested in "Fandoms" and the advocacy and sentiment that comes building a loyal base and community. Tumblr sends more content to other social networks than any of the other platforms out there, with 60% of their engagement happening downstream. "Content is King and if you put something out there that's brilliant, it's going to be shared on-and-on," added Sistani. Tumblr continues to see reposts of blogs a year after they're posted. "We're really a positive platform, a happy place in the world. Maybe Disney is that place, but we're certainly the happiest place on the Internet," said Sistani. Tumblr considers their platform as a media brand where the user owns their own Tumblr. "When you send your TV audience to different social networks, they are monetizing your content," said Sistani. "When you're on Tumblr, it's yours and you monetize it the way you want," she added. "I think we make it different for advertisers, purposefully. You can't just advertise on Tumblr. You have to come in as a user and put up great content. You can have it sponsored by putting a megaphone around it. Great content will live on Tumblr and beyond. Tweets from a brand will be put on Tumblr and will live in a bigger way than on Twitter." Sistani shared the example of a tweet that was retweeted 2000 times on Twitter, but when it hit the Tumblr platform, it was reblogged 50,000 times. Taco Bell has a vibrant community that is sending content and syndicating it both on and off the platform. "We're currently in test with the mobile ordering app, said Tressie Lieberman, Taco Bell's Director of Social and Digital Marketing. "A few years ago it seemed out there for mobile ordering and going through the drive though," Lieberman added. She explained that Taco Bell wants to give their customers and fans access in as many ways as possible. Their goal is to give their advocates the content they want to share. "We hold our content to a high standard. We did a breakfast launch and sent out 1000 flip phones to people who were excited about breakfast and the waffle taco," said Lieberman. Every day Taco Bell would call them with secret missions. Their fans would then post something to Tumblr, Instagram, and/or Twitter to compete. Although there were just 1000 people with the phones, they were fans that love the brand and made a huge impact with the number of conversations that were generated. "Find the people who love your brand and help them share your story," added Lieberman. "If I take a step back, Pandora is only successful because of mobile, said Pandora's VIP of Digital, Lizze Widhelm. If you can be ubiquitous and be there when people need you. She urges mobile content providers to find a discovery element. New artists, new people, those connections are strong and will sustain. We're focused on being the choice for radio. I think there's data that's really important. At Pandora, they don't focus on followers and subscriber count too much. "We've long had this heritage of reaching out and touching listeners and finding what they did like about radio, what they didn't like," said Widhelm. The early heritage for their app was in touching people. Over time, Pandora started using it as a listener outreach tool. Pandora sends lots of swag to listeners, including thousands-and-thousands of beach towels to listeners for the summer. Pandora is now focusing on two parts of monetization: Having great scale and having great data. By having great content relationships with musical artists, they're in the position to package and monetize their brand. "People are coming to us and we can have value exchanges," said Daniel Frydman, Generator's VP of Design and User Experience. At Generator, mobile is the first of a series of engagements to drive people to a funnel down the line. "Fans are coming to us saying, 'hey we want to know more about this show,'" said Frydman. He explained their ways to monetize the app including, sponsored content to develop a sense of market share and driving out third party purchases. Generator is seeing massive years-over-year exponential growth. Mobile provides them with immediate interactions. "Anything with a now moment, mobile is the way," said Frydman. At the end of the digital day, all mobile brands are looking for the secret sauce to monetize their platforms, while maintaining a great user experience for their loyal fans. Julie Spira is a social media strategist who was on the Internet before most people even knew there was an Internet. Her digital career began over 30 years ago where she was the youngest female executive at RKO Radio Networks, the country's first digitally-delivered satellite radio network. She's held several executive positions at communications companies and is the host of Mobile Dating BootCamp, CEO of Social Media and More, and founder of Cyber-Dating Expert, where she helps singles find love on the Internet.